This book examines the identities of [email protected] in a post-9/11 America. In an effort to not hijack and prescribe new [email protected] identities from one author’s perspective, this book is constructed in dialogue format with 4 different perspectives and 4 different approaches. We ask the questions: What has triggered such an interest in [email protected] in recent times? What types of poetry, writing, and art is being created and what are the social factors that have led to new [email protected] identities? ¬ is book addresses four di erent identities within the “[email protected]” identity such as xicanindio (Carmona), inmigrante (Lima), [email protected] (Chavarria), & the fluid C[email protected] (Sanchez) as a jumping off point to discuss all that is happening currently. The last few years have seen several incidents of outrage from the people and now we must respond the best way possible, through our writings and artwork. 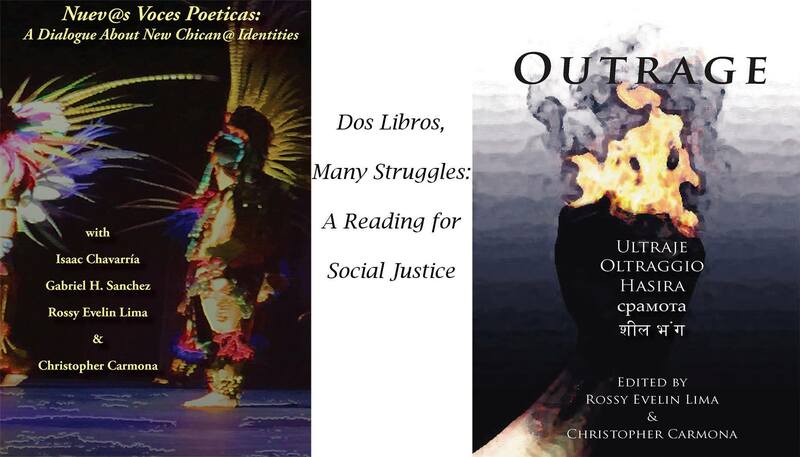 This anthology is dedicated to the atrocities of the shootings of black and brown people to the injustices that the refugees have encountered when fleeing war-torn countries, to the rise of [email protected] sentiment that has led to the banning of Mexican American and Ethnic Studies, to the banning of brown bodies through xenophobic legislation, and the constant and complacent racism against anything Middle Eastern or Asian, to the complete disregard to indigenous rights in the name of corporate progress.